The IRS issued a news release (IR-2018-254) that states it gives additional information on the excess business loss rules of IRC §461(l) and net operating losses given the changes made in the Tax Cuts and Jobs Act (TCJA). The TCJA modified existing tax law on excess business losses by limiting losses from all types of business for noncorporate taxpayers. Excess business losses that are disallowed are treated as a net operating loss carryover to the following taxable year. See Form 461 and instructions, available soon, for details. While the release promises a final Form 461 “soon”, a draft version was released in August along with instructions. 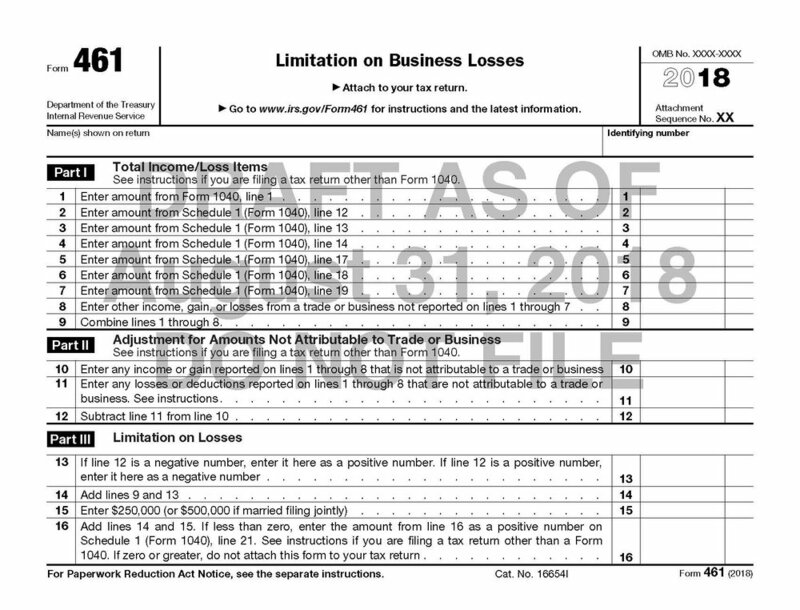 However, that draft form and instructions have left many with questions regarding how this provision will work, including whether an NOL created by this provision in 2018 will have to be tested again as a “business loss” on the 2019 return. The release provides the following information regarding net operating losses following the changes in TCJA. TCJA also modified net operating loss (NOL) rules. Most taxpayers no longer have the option to carryback a NOL. For most taxpayers, NOLs arising in tax years ending after 2017 can only be carried forward. Exceptions apply to certain farming losses and NOLs of insurance companies other than a life insurance company. For losses arising in taxable years beginning after Dec. 31, 2017, the new law limits the NOL deduction to 80% of taxable income.